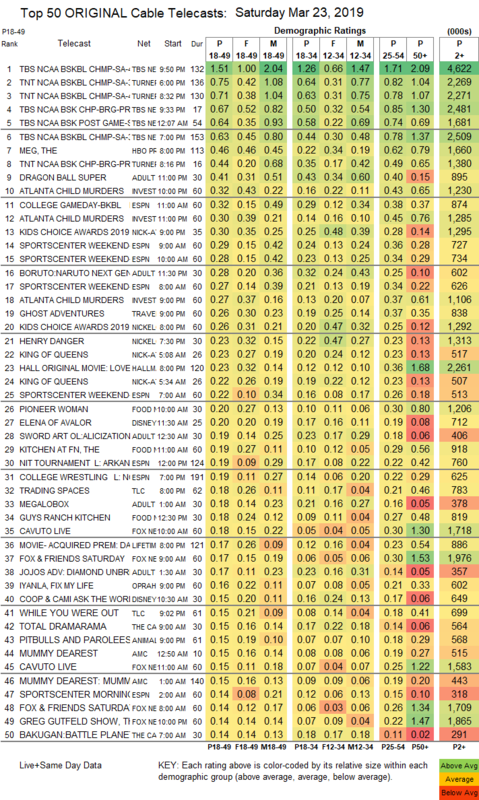 NETWORK FINALS: The NCAA TOURNAMENT on CBS adjusted to 1.7/1.2, and 48 HOURS lost 0.1 in final numbers. CABLE HIGHLIGHTS: It was another big day for the NCAA TOURNAMENT, which supplied the Top 6 (and 7 of the Top 8) telecasts of the day, led by TBS’s late primetime Auburn vs. Kansas game at 1.51. Adult Swim’s line-up performed as follows: DRAGON BALL at 0.41 and 0.09/304 & 0.12/345K compared to last week’s 0.30 and 0.09/284K & 0.10/306K, BORUTO up 0.07 to 0.28, MY HERO ACADEMIA up 0.04 to 0.24/505K, SWORD ART ONLINE up 0.01 to 0.19, MEGALOBOX up 0.01 to 0.18/378K, JOJO’S BIZARRE ADVENTURE up 0.01 to 0.17, BLACK CLOVER steady at 0.17/343K, HUNTER X HUNTER up 0.03 to 0.16/315K, NARUTO up 0.02 to 0.16/335K, and ATTACK ON TITAN up 0.02 to 0.12/255K. ID’s ATLANTA CHILD MURDERS was at 0.32/0.30. The KIDS CHOICE AWARDS had the split Nick-At-Nite/Nickelodeon rating that happens when a show runs past 9PM, in this case at 0.30 for the last 35 minutes and 0.26 for the preceding hour, with simulcasts at 0.05 on Nick Jr, 0.03/216K on TeenNick, and 0.01/96K on Nicktoons; the lead-in HENRY DANGER was at 0.23 on Nickelodeon, 0.05 on TeenNick, and 0.01/110K on Nicktoons. 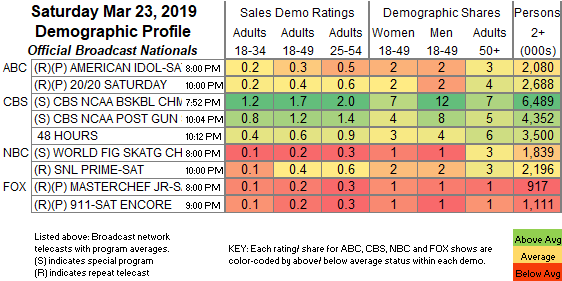 Travel Channel’s GHOST ADVENTURES was steady at 0.26. Hallmark’s original movie LOVE TO THE RESCUE was at 0.23, and Lifetime’s movie DAUGHTER’S DECEPTION was at 0.17. On Food Network, PIONEER WOMAN rose 0.06 to 0.20, KITCHEN AT FN ticked down to 0.19, and GUY’S RANCH KITCHEN was at 0.18. On TLC, TRADING SPACES edged up 0.02 to 0.18, and WHILE YOU WERE OUT was steady at 0.15. On OWN, IYANLA, FIX MY LIFE gained 0.02 to 0.16, and FAMILY OR FIANCE ticked down to 0.13. Syfy’s ALIEN NEWS DESK was at 0.07.